Well we certainly can’t complain about Friday’s weather…other than the rainstorm that sped through in the AM. The afternoon and evening temperatures were wonderful. Earlier this week I received some new photo equipment and spent some time wandering around the house with my camera. I captured this image of a lone daffodil. 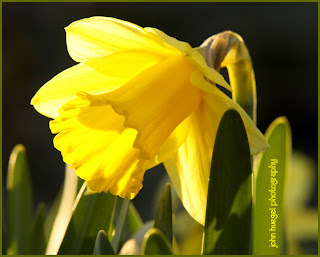 It seems like I take one of these each year; the daffodils are some of the first things to turn green on our property. So enjoy this flower has a symbol of other green things to come. Pretty soon the whole world will be green and we’ll take for granted these early flowers as signs of a new season. This entry was posted in flowers by admin. Bookmark the permalink.